Krazan is proud to be a leader in the use of non-destructive techniques for forensic investigation condition assessments. We are confident that we can offer rapid state-of-the-art capabilities that allow for thorough evaluations of bridges and structures repair. 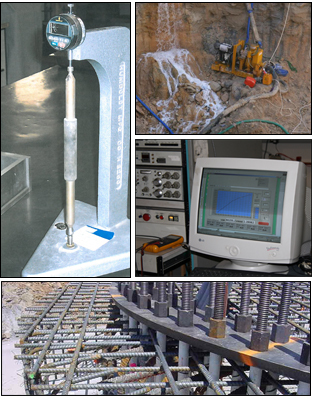 As a full-service testing and inspection organization, we are equipped to complement these tools with sampling and laboratory evaluation capabilities. Half-cell corrosion testing, which allows for the mapping of the extent of corrosion in concrete. Resistograph Technology, which allows for the determination of the decay in the timber and wood components of a structure. Impulse Radar, or ground-penetrating radar, which is used extensively for geophysical investigations. Flatjack Technology, which allows for the determination of stress and shear characteristics of a masonry wall without the need to remove sections. The Windsor Pin Device, which is used to ascertain and indicate the strength of masonry mortar and concrete. Acousto-Ultrasonic Technique, which is used to analyze the integrity of building materials-detecting voids, delaminating, and imperfections in structural components–through an acoustic pulse. Krazan is on the cutting edge of testing and inspection of building enclosure components and systems. Our IAS (ICC) accredited laboratory provides product windows and exterior finishes, while our forensic staff offers state-of-the-art techniques such as infrared thermography to assist in the commissioning of a building or in determining the source of water failures in the building envelope. Click here to view some of our recent forensics work. Krazan has been getting the job done right on Forensics jobs for more than 30 years.